The inclement weather of winter represents a myriad of risks to your Baltimore business. Snow and ice in particular can effect your businesses ability to stay competitive, ship or receive product, and finally, and most importantly, your employees and customers health. 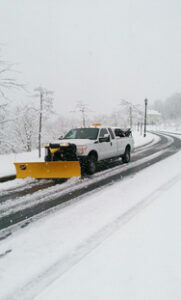 That’s why the Atlantic Maintenance Group is here to help you with your commercial snow removal needs. When you’re a small business your resources are limited, revenue is tight, and every customer is important. Your carefully balanced budgets, for stock, and payroll can be thrown into chaos by poor winter weather. It can be tempting to stay open through winter weather, hoping to get the few customers that come out, or stay closed until the worst of it has passed. It’s up to you to do a risk-benefit analysis in the case of staying open during the worst of the snow and ice. However, the day after the winter storm finishes you need to be open to get any customers you can, otherwise loyal customers might take their business elsewhere. The Atlantic Maintenance group is here to help. We can quickly clear your driveway, parking lot, and side walk so that your customers and employees can come into your business the minute you decide to open. Ice and snow can affect your ability to send and receive needed product, the longer your businesses drive and parking lot are snowed in, the more shipping delays might cost you. That’s why when the weather passes it’s important you have your driveway and loading area clear so that whatever shipping or receiving you need to do can safely happen. Ice and snow represents a liability to your employees and customers. Customers and employees who slip and fall on your parking lot, walkway, or sidewalk can seriously injure themselves. As the property owner, or renter, you may be liable for their injuries. The Atlantic Maintenance Group has access to special equipment for removing snow from your walkways and sidewalks, and can apply salt and ice-melting compounds to keep them clear from ice. At Atlantic Maintenance we know just how important it is to keep your Baltimore business or home accessible even during the most brutal weather conditions, that’s why we provide expert commercial snow removal services for clients throughout Maryland, Pennsylvania, Virginia and Delaware. Make managing your property stress free and let our team of snow removal experts take care of everything from shoveling to plowing. We’re experienced in removing snow from parking lots, roads, sidewalks, as well as salting and ice melting. This entry was posted on Friday, January 30th, 2015	at 2:30 am	and is filed under Blog, Snow Removal	. You can follow any responses to this entry through the RSS 2.0	feed. Both comments and pings are currently closed.